This page perhaps should be more correctly titled Flame Soldering by Dummies and certainly not as that famous brand of book would put it Flame Soldering for Dummies. 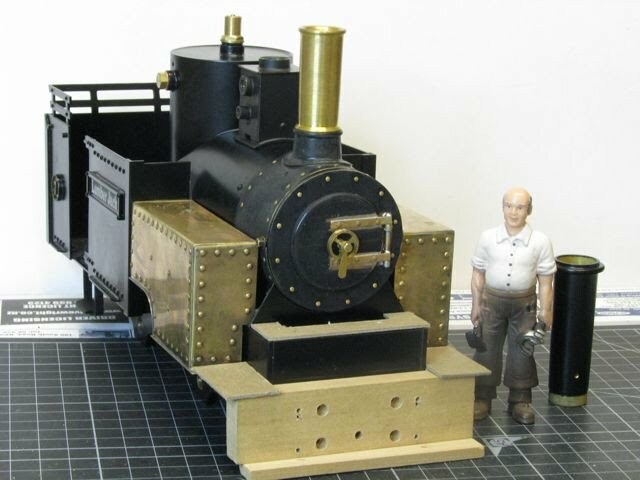 I am no expert and this has been written after only limited practice on one project after watching a clinic on the technique by Andy Whyman at the recent NZ Garden Railway Convention. However onto my brief how-to. Give parts to be joined a very good clean/buff with fine sand paper (400 or 600 grit) or as in my case with a fibreglass draughtman's eraser. Clamp up the joint, apply some liquid flux to the joint (Duzall in my case) and then little bits of 60/40 multicore solder. It really is preferable to use non-flamable material to clamp the work to rather than the charable MDF I've used. So preferable that I am now accumulating non-flamable clamping material to do this part better! Light your micro-torch and allow the flame to settle. and flash down into the joint leaving very little cleanup required. 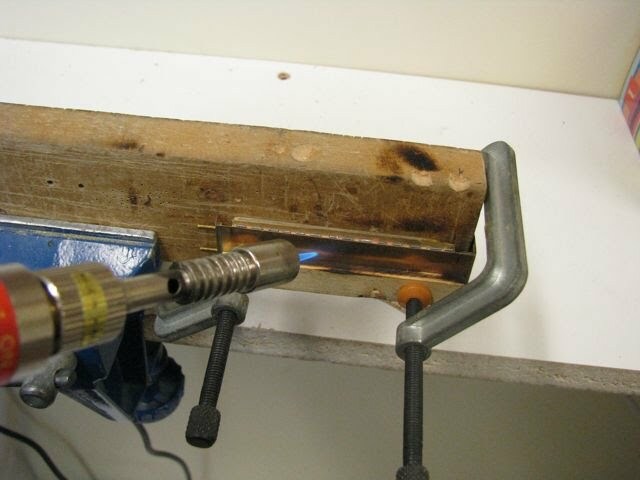 You don't apply the flame directly onto the solder! Joint complete, allow to cool to save your pinkies! heat easier without charing the MDF & wood I'd clamp with, hmm and if I had done it right handed without the camera! is the top joint on the left side assembly (a side tank). The knife in the picture is all that was used to clean up the joint. nerve to complete the project by flame soldering and the results are many times better. Once I've completed a soldering session I drop the assemblies into a jar of citric acid to soak for a few hours to remove any left over flux and then give a final wash in hot water and detergent (just before doing the dishes it no-one is watching). 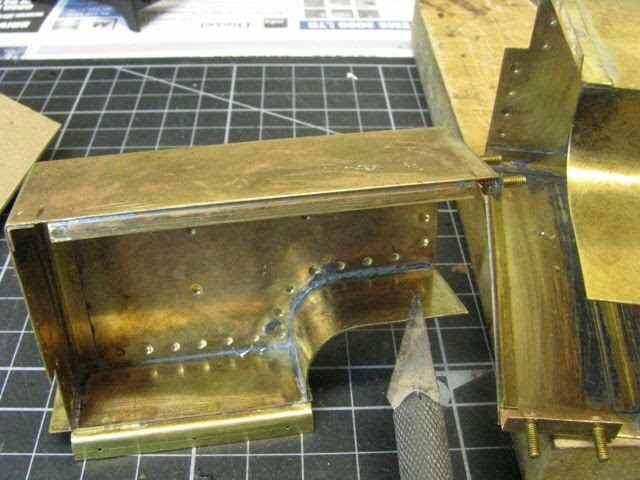 Below is another example of the type of nice clean joint you can achieve with flame soldering. 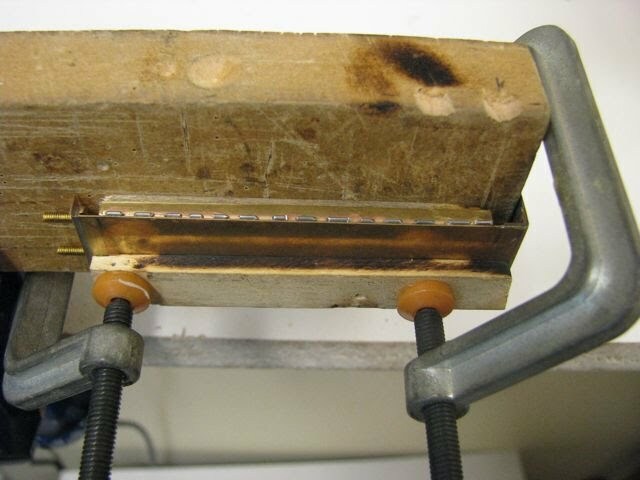 Once the joint is clamped up it is much quicker to flash to solder into the joint that it is with a soldering iron. I expect would have needed a big electric soldering iron to do the same job. Please feel free to add you methods and experiences as I am only learning this technique, I have a long way to go to get good at it but I very happy with what I have learnt so far.